mixed media on wood: acrylic paint, metallic paint, collaged paper. Interesting and colourful image, great work Jennifer. Admirable work. Good and pleasant week. Provocative and evocative, as usual. Wow...awesome as always ! Excellent work ! Have a wonderful week. Only you could make twisted look sort of normal. Fine work, Jennifer! Hands in feet and feet in hands...GREAT ART! This is strange, weird, frightening, and most of all an amazing piece of art! Yes, strange and frightening .... but very beautiful, Jennifer ! Creative and amazing art, Jennifer...! Oh my, the imagination goes wild, Jennifer, lol! Fabulous creative artwork and and so beautifully presented! Marvelous colour composition and I love the toe and nail polish too! Comme toujours une très belle créativité. Déjanté et créatif : j'aime beaucoup . Fantastic memento mori! Hope you enjoy the day and wish you a pleasant new week. superb artwork. 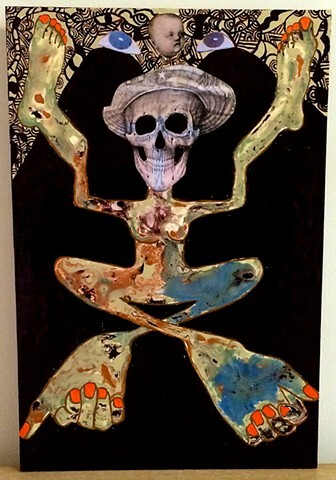 great symmetry and sympathetic smiling skull, the inversion feet/hands is really suggestive. Happy spring to you, Jennifer ! Gruselig aber sehr kreativ ! Ein schönes Wochenende, Jennifer ! This is cool. I really like it. Un interesante trabajo artístico. Me gusta tu estilo ! I love your work! Very creative and free-spirited! it's really a pleasure to see this masterpiece again !